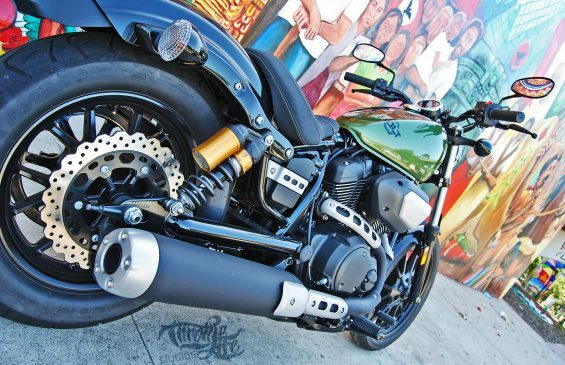 2013 Star Motorcycles Bolt: The New Old School | Throttle Life! The bustling city of downtown San Diego served as my backdrop to evaluate this new school bobber. Serving as our kick-stands up point of departure was the iconic Hard Rock Hotel which was more than fitting as both Hard Rock and Bolt embody a spirit of rebellious freedom. Navigating through city traffic or bolting down the highway to Coronado Island, the bad boy Bolt provides enough torque to effortlessly get around thanks to the fuel-injected, 58-cubic-inch (950cc),belt-driven 4-valve air-cooled V-Twin with a 2 into 1 exhaust that bellows a deep sound for a stock system. The 3.2 gallon fuel tank allowed for more than enough seat time between fill as I bolted from the Midway Aircraft Carrier Museum to Graffiti Park to the San Diego Air and Space Museum, back to Coronado Island and eventually back to the Hard Rock with more miles still left in the tank.